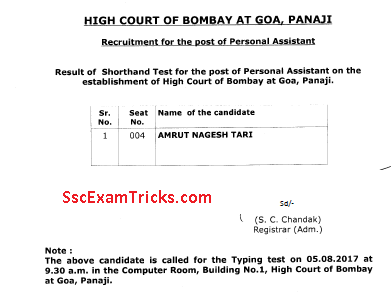 Bombay High Court Poen Clerk Result 2017 Declared- Bombay High Court Personal Assistant (PA) Admit Card 2017 Call Letter Exam Date - Bombay High Court PA Recruitment 2017 - Bombay High Court 108 Personal Assistant Vacancies 2017-18 - www.bombayhighcourt.nic.in. The good news is that Bombay High court has declared the final result of Sweeper on official website. 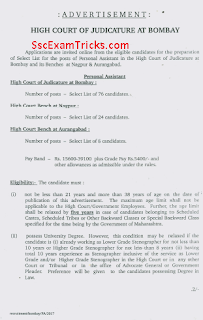 List of Eligible Candidates to appear for Shorthand Dictation Test for the post of Personal Assistant. List of Candidates whose application has been rejected for the post of Personal Assistant. The validity period of the Wait List for the Post of Peon/Hamal has been extended for the period of One year w.e.f. 07.07.2017 upto 06/07/2018. 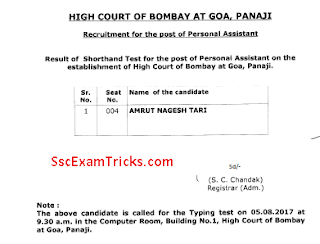 The latest and good news is that Bombay High Court has uploaded the result of Personal Assistant on official website . 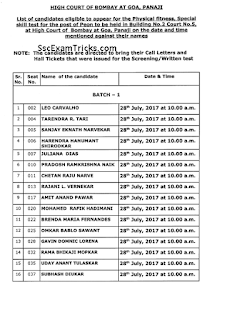 The selected candidates were called for typing test which was scheduled to be organized on 05th August 2017. Finally, the result has been uploaded now on official website. Today, the good news is that Bombay High Court has declared the result of Poen and Clerk on official website. 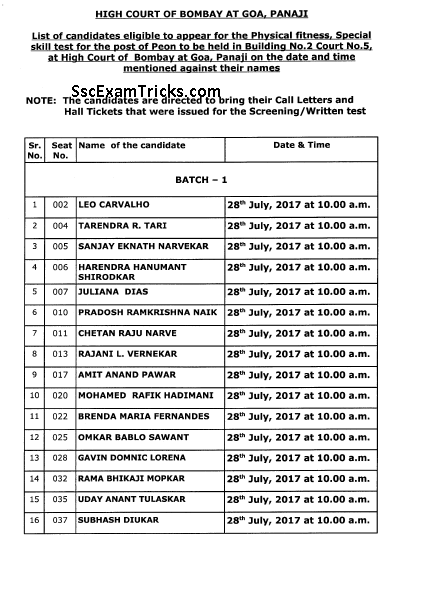 The list of qualified candidates will face Physical Fitness and Special Skill exam held on 28th, 29th July 2017 and Typing Test held on 30th July 2017 at the exam venue. The admit card has been issued to the candidates on their correspondence address. 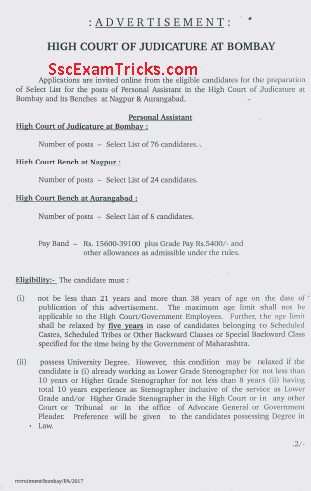 High Court of Judicature at Bombay has released notification for the posts of Personal Assistant (PA) and invited applications from 20th June to 04th July 2017 at www.bombayhighcourt.nic.in.Interested and eligible candidates can download the notification and can apply online for this recruitment before the last date. · Go to official website www.bombayhighcourt.nic.in. · Click on ‘New Registration’ link. · Fill the personal details of application form and next register button. · Go to login button and enter user name with password. Press ‘Login’ button. · Take the printout of application for future exam. 3. Press ‘login’ button and download your Bombay High Court Admit Card/Result 2017.